British secret agent James Bond once battled “the man with the golden gun.” Now, real-life imaging and cancer researchers at The University of Texas M. D. Anderson Cancer Center are developing their own golden weapon of sorts. 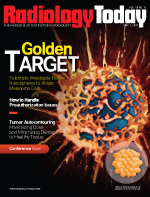 Chun Li, PhD, and colleagues are working on an innovative photothermal technique that aims to use hollow gold nanospheres as a golden target to ablate cancer tissue. Li, a professor in M. D. Anderson’s department of experimental diagnostic imaging, heads a project developing a therapeutic nanotechnology to treat cancer. “The ultimate goal of cancer treatment is to deliver therapy selectively to the tumor while sparing the surrounding normal tissue. With the recent developments in nanotechnology, we’re getting much closer to our ultimate goal,” he says. The researchers are seeking a treatment for melanoma. They hope to deploy peptide-guided, hollow gold nanospheres that can initially target and then deeply penetrate and ultimately ablate melanoma cancer cells when the nanospheres are illuminated by near-infrared light. To date, their efforts have been restricted to the laboratory setting, where they’ve worked with cultures and rodent models. But the researchers believe their work has clinical potential. At a May 2006 medical conference in Florida, Li exchanged notes with Jin Zhang, PhD, a professor in the University of California, Santa Cruz’s department of chemistry, whose main research interests included the design, development, characterization, and application of nanomaterials, with a particular emphasis on their optical and electronic properties. During the conference, Li gave a presentation on cancer-related photothermal ablation therapy and its challenges. Zhang was in the audience because he was at the conference to make a presentation about his own work on the development of hollow nanospheres. As Zhang listened, he began to think that their separate research paths could be commingled to generate a potential solution. Specifically, he thought that the application of solid gold nanoparticles limited Li’s research as far as light absorption. Narrow yet robust, tunable abilities enable the hollow nanoparticles to absorb light across visible and near-infrared spectrums, which differentiates them from other nanoparticles. “The highly tunable absorption properties demonstrated by hollow nanoparticles are absent in solid nanoparticles,” Zhang adds. But other crucial elements come into play. Zhang says these involve nanoparticle shape and size, considerations that directly impacted Li’s efforts toward cancer treatment. “For biomedical applications, the nanoparticles’ spherical shape is highly advantageous in terms of delivery and so is the size,” Zhang says, noting that a small size and spherical shape enable increased uptake and cellular penetration. “Also, with hollow nanospheres, the shell size and thickness can be adjusted—another significant advantage,” he adds. It’s easy to understand why Li and colleagues were initially attracted to applying photothermal ablation to melanoma treatment. The technique delivers a specific amount of cell-destroying energy directly into a tumor. As such, it represents a potential weapon against the dangerous skin. In their recent paper in Clinical Cancer Research (“Targeted Photothermal Ablation of Murine Melanomas With Melanocyte-Stimulating Hormone Analog-Conjugated Hollow Gold Nanospheres”), Li and colleagues characterized melanoma as one of the most deadly cancer manifestations. Increasing in incidence, melanoma is highly treatable when diagnosed early, but it tends to be ignored. When it progresses into metastasis, the five-year survival rate is only about 13%. The challenge for photothermal ablation with near-infrared laser light is differentiating between diseased and healthy surrounding tissue. “This is true for photothermal ablation, as well as for other treatment modalities,” says Li. Nanotechnology can increase its specificity, when scientists link hollow gold with a targeting peptide that’s strongly attracted to a melanocortin type 1 receptor, which is highly abundant in melanoma cells. This peptide helps the nanosphere find and bind to the melanoma cells, enter those cells, and accomplish their mission: killing cells through heat converted from near-infrared light. The M. D. Anderson Cancer Center scientists were able to bring these elements together in a technique that utilizes hollow gold nanospheres coupled with near-infrared light and exhibits targeting, penetration, and ablation capabilities. The researchers wrote that the nanospheres they used have a unique combination of small size (outer diameter of 30 to 60 nm), spherical shape, hollow interior, and a strong and tunable absorption band (520 to 950 nm). Further, when coated with polyethylene glycol, these new-generation nanospheres display prolonged blood circulation half-life. With their enhanced permeability and retention, they have a better chance of reaching the tumors through the leaky tumor vasculature. “Because the passive diffusion of the nanoparticle to tumors is dominated by the pore cutoff size of the tumor blood vessels, the [smaller nanospheres] as compared with larger silica-cored nanoshells have the obvious advantage in crossing the tumor vessel wall,” the researchers added. For their study, the researchers first applied the technique to melanoma cell cultures developed in the laboratory and then in mice with melanoma. These rodent experiments represented the first ever in vivo, active targeting of hollow gold nanoparticles combined with photothermal ablation. With the lab cultures, they used applied fluorescent tagging to hollow gold nanospheres. They found that the peptide-targeted nanospheres breached the cell membrane and were drawn right into the cells. At the same time, hollow gold nanospheres without the targeting peptide were not. When the researchers beamed near-infrared light onto treated cultures, most cells with targeted nanospheres died, and the rest were severely damaged. Further, irradiation with near-infrared light alone or treatment with nanospheres alone without near-infrared light left the cultured cells unaffected. The researchers concluded that peptide targeting of nanospheres and irradiation had the greatest effect as far as destroying targeted cancer cells. When moving forward with mouse experiments, the researchers injected both targeted and untargeted nanospheres into the lab animals and applied near-infrared light. They observed that after irradiation with near-infrared light, targeted nanospheres did more than eight times the damage to melanoma tumors. Specifically, nearly 66% of tumors were killed in the mice injected with targeted nanospheres. Conversely, in mice injected with untargeted nanospheres, the researchers witnessed only a 7.9% destruction of cancerous tumors. In addition, the nanosphere/photothermal ablation combination destroyed the tumors with a laser light dose that was only 12% of the necessary dose when photothermal ablation was used without nanospheres. The lower dose could spare surrounding tissue. The researchers also showed that noninvasive FDG-PET is useful for monitoring the early treatment response after photothermal ablation. “This can have significant implication in the clinic in guiding repeat ablation procedures,” they wrote. The researchers measured the tumors by using PET to monitor tumor activity by imaging the amount of FDG-tagged glucose metabolized. Essentially, the action lit up the tumor, a brightening revealed by PET. Tumors treated with peptide-targeted nanospheres remained basically dark, meaning that they contained little amounts of metabolized tagged glucose. Further, the fluorescent tagging revealed that peptide-targeted, hollow nanospheres were present throughout the tumor, while untargeted nanospheres only gathered near the blood vessels feeding the tumor. Despite the promising results of selective photothermal ablation of melanoma with hollow gold nanospheres, barriers remain that must be addressed before the technique can be clinically tested. “The most important biological barriers involve the effect on the liver and spleen,” says Li, explaining that the body naturally tends to route foreign particles and defective cells toward those organs for destructive processing. In the mice, the researchers found that while most of the targeted nanospheres collected within the tumor, small amounts gathered in the liver and spleen. This indicated a need for more selective targeting of the nanospheres, they said. The researchers think improvements in the physicochemical properties of the hollow gold nanospheres, including particle size and surface characteristics, could significantly decrease their retention in the liver, spleen, and kidney. But more work must be done before anyone can consider using the technique in humans, Li says, including more detailed preclinical studies that focus on excretion and clearance, safety, and effectiveness of targeted, hollow gold nanospheres. Li adds that the research has revealed that PET is an effective monitoring tool, and if and when the nanosphere and photothermal ablation techniques move into the clinical setting for cancer treatment, PET could reveal patients’ response to treatment.